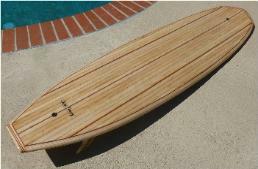 The Chameleon 8'6" - Goosebay Sawmill and Lumber, Inc. The Chameleon was stretched by a full 12″ but kept all the other dimensions the same. Just a little more flotation to accommodate the bigger riders looking for performance. The 8′ 6″ Chameleon is the longboard that when its built according to plan is an “egg” that lets you make the most of any size surf. But, like its little brother the 7’4″ Chameleon it can be modified to really and maneuverability.